GOFRUGAL Alert is a cloud based real-time business monitoring tool to notify/send critical business information as SMS or E-Mail. This helps Retailers not only save time, but also gain better control over their delivery process. GOFRUGAL Alert Instant Messaging service to control information flow in & out of your branches, as well as across branches & between branches & head office, with Alert module. This in turn helps you create win-win relationship with customers, suppliers and other stakeholders. Alert the manager when the stock level reaches minimum for better utilization. When an employee types wrong password for manger's login or when he stops the daily backup schedule process mid-way at EOD. Alert the manager as soon as an employee cancels a bill, applies unsanctioned discounts or edits the bill without prior approval. Greet new customers, as well as on special occasions such as festivals, birthdays etc. Send a daily summary of sales/purchase report as PDF to the line manager at a scheduled time. Remind your customers by sending them loyalty points calculated from their last purchase. No more installation. Sign-up & start using instantly. "Alert helps us keep in touch with customers at any time. We are able to send them SMS after every purchase made. 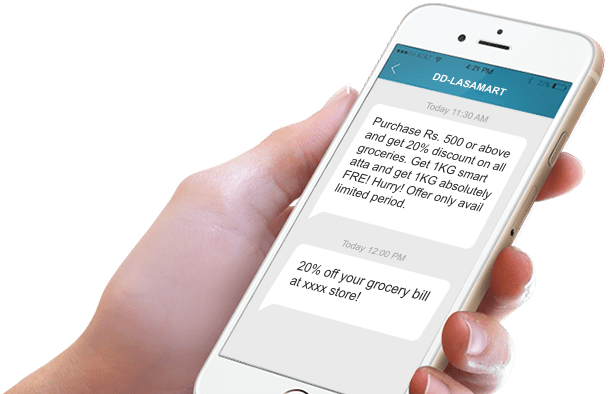 I strongly feel Alert will become an integral part of GOFRUGAL solutions "
" Of all the features in Alert, the messaging feature linked to SMS gateway really makes this stand apart. Add to this, the fail-safe support provided by Alert team on product doubts & queries "
1. GOFRUGAL Alert Lease for Indian residents only. 3.In addition to SMS, E-mail alerts can also be configured and sent provided there is valid SMS balance within the validity period. 4. All the prices above mentioned are inclusive of taxes. A Mobile SaaS solution that helps you to send notifications or Alert of the transactions / trade from your business management software. You can configure events, message formats and send bulk SMS(s) to notify your customers and employees/company representatives. Who can use GOFRUGAL Alert? All RPOS retailers can use GOFRUGAL Alert. GOFRUGAL Alert is seamlessly integrated with RPOS solution. Customers can easily integrate GOFRUGAL Alert by clicking signup link from the product. Those who require customized applications can contact alert-team@gofrugal.com. Very soon it'll be available with other GOFRUGAL solutions. It works with GOFRUGAL Retail solutions. Critical business information from these products (running in the respective stores/shops) is notified in real time to a mobile device. There are other solutions in the market. Why should I choose your solution? GOFRUGAL Alert is directly integrated with GOFRUGAL suite of products. All events and exceptions are handled in real time. It helps you to save time in tracking & monitoring your business process and focus on decision-making. It also helps you to gain better control, integrate your business processes and gives the power to prevent, rather than react to potential show-stoppers in your company processes. What are the types of reports available in Alert? GOFRUGAL Alert has an in-built dashboard that displays day-wise status report for the number of SMS sent, delivered etc., as well as separate reports on each & every SMS sent, invalid mobile number details and so on. In addition, you can schedule module-wise reports including but not limited to sales, purchase, stock, payments & receipts. Do I need an internet to work with? Yes, internet is mandatory for GOFRUGAL Alert since this is a cloud based application. Will GOFRUGAL Alert work throughout the world? At present, SMS Alert service is avaiable in India only. You can contact alert-team@gofrugal.com for more info on other countries. Is GOFRUGAL Alert a desktop application? No, it is a SaaS service. You can enable configurations and get reports from the web only. What are the pricing plans for GOFRUGAL Alert? How I can buy or renew it? In our product itself, there is a provision to buy or renew plans by using credit/debit card or net-banking payment method. Can I use my Shop name as a Brand name for sending SMS? Yes, you can use your Shop name as a Brand name. It will be tagged in your sender ID; maximum characters allowed is 6. Separate charges are applicable for this feature.